Melvin Thomas Ott (March 2, 1909 – November 21, 1958), nicknamed "Master Melvin", was an American former professional baseball player who played in Major League Baseball (MLB) as a right fielder for the New York Giants, from 1926 through 1947. Ott was born in Gretna, the seat of government of Jefferson Parish in suburban New Orleans. He batted left-handed and threw right-handed. He was an All-Star for eleven consecutive seasons, and was the first National League player to surpass 500 career home runs. He was unusually slight of stature for a power hitter, at 5 feet 9 inches (1.75 m), 170 pounds (77 kg). He was elected to the National Baseball Hall of Fame in 1951. In his 22-season career, Ott batted .304 with 511 home runs, 1,860 RBIs, 1,859 runs, 2,876 hits, 488 doubles, 72 triples, 89 stolen bases, a .414 on-base percentage and a .533 slugging average. 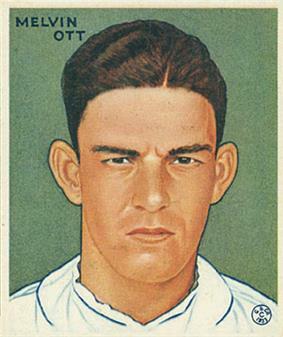 Ott was a six-time NL home run leader, in 1932, 1934, 1936–38, and 1942. From 1928 to 1945, he led the New York Giants in home runs. This 18-season consecutive dominance is a record; no other player has ever led his team in more consecutive years in a single Triple Crown category. He was both the youngest player to hit 100 home runs and the first National Leaguer to hit 500 home runs. He passed Rogers Hornsby to become the all-time NL home run leader in 1937 and held that title until Willie Mays passed him in 1966. Because of his power hitting, he was noted for reaching base via the base on balls. He drew five walks in a game three times. He set the National League record for most walks in a doubleheader with six, on October 5, 1929 and did it again on April 30, 1944. He tied an MLB record by drawing a walk in seven consecutive plate appearances (June 16 through 18, 1943). He also led the NL in walks six times: in 1929, 1931–33, 1937 and 1942. He twice scored six runs in a game, on August 4, 1934 and on April 30, 1944. He was the youngest major leaguer to ever hit for the cycle, until Mike Trout hit for the cycle in 2013. Ott was the first NL player to post eight consecutive 100-RBI seasons, and only Willie Mays, Sammy Sosa, Chipper Jones, and Albert Pujols have since joined him. He used a batting style that was then considered unorthodox, lifting his forward (right) foot prior to impact. This style helped with his power hitting. More recent players who used a similar style include Harold Baines and Kirby Puckett, as well as the Japanese home run king, Sadaharu Oh. In 1943, all of his 18 home runs came at home; only two others ever had a greater number of all-homefield home runs. Of Ott's 511 career home runs, 323 of them, or 63 percent, came at home. (Home Run Handbook, John Tattersall, 1975). Because of this, his home run record historically has been downplayed, suggesting that a 257-foot (78 m) foul line at the Polo Grounds resulted in higher numbers at home. Sportswriters often jokingly referred to him as the master of the "Chinese home run" as such short homers were called at the time; Ott would often respond by noting that if it was so easy to inflate his homer totals by hitting over that fence, all other hitters in the league would be doing it. As a balance, the Polo Grounds had the deepest power alleys in baseball. Also, he hit more career home runs in foreign stadiums than any other National League hitter at the time of his retirement. In some of his better seasons, he hit more homers on the road than in the Polo Grounds. Though there may be reason to believe that he was a better hitter than his record holds due to differences in National League and American League ball specifications ("All too forgOtten" Steve Treder, October 2, 2007). Those differences are considered the most outstanding in the history of the game and made it considerably harder for National League hitters to achieve home runs. During the prime of Ott's career, eleven seasons from 1931 through 1941, American League batters averaged 21% more home runs—peaking at 41% more home runs—than their National League counterparts. Babe Ruth and Jimmie Foxx, contemporaries, and both American League players, were the only batters to surpass Ott's record during this time. He played in the World Series in 1933, 1936 and 1937, winning in 1933. He hit two home runs during the 1933 series. In game 1, he had four hits, including a two-run home run in the first inning. In game 5, he drove in the series-winning run with two outs in the top of the 10th, driving a pitch into the center-field bleachers. 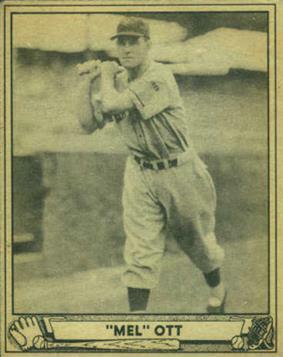 In the 1936 World Series, Ott had 7 hits and 1 home run. In 1937, he had 4 hits and 1 home run. Ott managed the Giants from 1942 until being succeeded by Leo Durocher midway through the 1948 season. The Giants' best finish during that time was third place in 1942. It was in reference to Ott's supposedly easy-going managing style that then-Dodgers manager Durocher made the oft-quoted and somewhat out-of-context comment, "Nice guys finish last!" Ott was the first manager to be ejected from both games of a doubleheader, when the Giants lost both games to the Pittsburgh Pirates on June 9, 1946. In 1951, Ott succeeded Chuck Dressen as manager of the Oakland Oaks of the Pacific Coast League, leading the club to a 80-88 finish (seventh place). In 1952, the Oaks finished 104-76 under Ott, good for second place in the PCL. 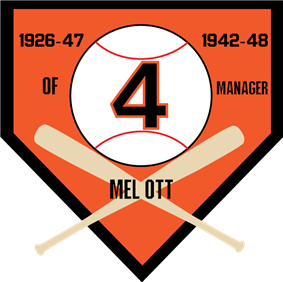 Mel Ott's number 4 was retired by the New York Giants in 1949. Ott was elected to the Baseball Hall of Fame in 1951 with 87% of the vote. His number "4" was also retired by the Giants in 1949, and it is posted on the facade of the upper deck in the left field corner of AT&T Park. He was a National League All-Star for eleven consecutive seasons, from 1934 through 1944 (MLB cancelled the 1945 All-Star Game and selections). He is one of only six National League players to spend a 20+ year career with one team (Cap Anson, Stan Musial, Willie Stargell, Tony Gwynn, and Craig Biggio being the others). He was a nominee for the Major League Baseball All-Century Team. After his playing career ended, Ott broadcast baseball on the Mutual radio network in 1955. 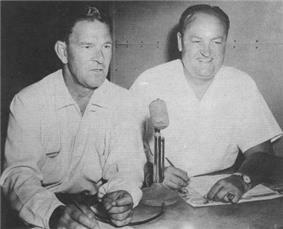 From 1956 to 1958, Ott teamed with Van Patrick to broadcast the games of the Detroit Tigers on radio and television. Ott was involved in an auto accident in Bay Saint Louis, Mississippi in 1958. He was transferred to a hospital in New Orleans; where he died one week later. He was interred in Metairie Cemetery. Ott died in a similar manner to two other New York Giants Hall of Famers: Frankie Frisch in 1973 and Carl Hubbell in 1988 (the latter 30 years to the day of Ott's death). Ott is remembered in his hometown of Gretna, where a park is named in his honor. Since 1959, the National League has honored the league's annual home run champion with the Mel Ott Award. In the 1989 film Field of Dreams, Ott was one of several deceased players portrayed in farmer Ray Kinsella's Iowa cornfield. In 2006, Ott was featured on a U.S. postage stamp, as one of a block of four honoring "Baseball Sluggers" — the others being Mickey Mantle, Hank Greenberg, and Roy Campanella. In announcing the stamps, the U.S. Postal Service stated, "Remembered as powerful hitters who wowed fans with awesome and often record-breaking home runs, these four men were also versatile players who helped to lead their teams to victory and set impressive standards for subsequent generations". Ott is also remembered in the name of the Little League of Amherst, New York. The Mel Ott Little League began in 1959, named for the recently deceased superstar. Passed Rogers Hornsby to become the all-time NL home run leader in 1937 and held that title until Willie Mays passed him in 1966. In 1999, he ranked number 42 on The Sporting News' list of the 100 Greatest Baseball Players and was a nominee for the MLB All-Century Team. He managed the New York Giants in seven seasons (1942–48). ^ Hardy Jr., James D. (2007). Baseball and the Mythic Moment: How We Remember the National Game. ^ Pellowski, Michael J (2007). The Little Giant Book of Baseball Facts. United States: Sterling Publishing Co. p. 352. ^ "Baseball Quick Quiz". Baseball Digest 31 (12): 77. December 1972. Retrieved December 16, 2011. ^ "Baseball Sluggers". The 2006 Commemorative Stamp Program.